This Sturdy Sign Supply Designed For Weather Resistance Can Be Used All Year Round! Sign Supplies Can Be Purchased With Confidence From Our Fast Ship Warehouse! A unique sign supply that displays outdoors, like this exhibit board, is the ideal means to greet clients at your shopfront. 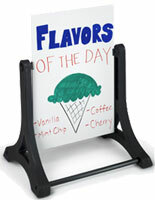 Our company produces this sign supply with four (4) colorful, wet-erase marker pens. Design eye-catching subject matters in vibrant, appealing color with the provided marker pens. The wet-erase marker colors are red, green, black and blue. 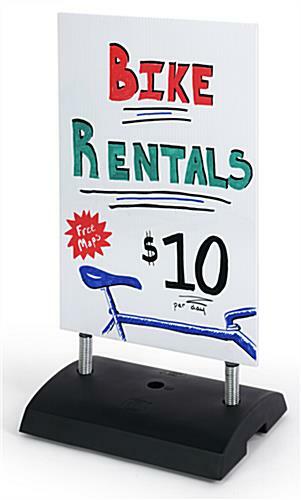 Compared to dry erase boards, this sign supply won't wipe off on fingers or clothes. People can brush by, kids can drag their fingers across your sign, and still no smudges! Just let your design dry for five (5) minutes before touching your graphics. Once it's dry, let it rain or snow because your communication isn't going anyplace. Create and modify colorful subject matters that are guaranteed to get recognized! This sign supply, likewise known as an exhibit board, is suitable for fast signage changes. Have to transform your daily deals into a specialized dinner menu in a snap? This quality sign supply with free-standing signage is the ideal answer. With glass cleaner, your message will wipe off the markerboard effortlessly and leave you with a blank slate to make a new outstanding design! It's also double-sided for more publicizing capability. This incredible heavy-duty sign supply in stock will display your message through the rain, sleet, or snow due to its unique drying ink! Utilize it inside and outside without the fear of your statement washing off, similar to what would happen with a dry erase board. Your sign supply is secure in rain and winds up to 20 mph. We ship this sign supply with a 24" x 36" corrugated acrylic exhibit board, marker pens, and a weighty duty acrylic springer base in the package. The springer base, also observed on some of our other exhibit boards, is moveable and simple to use. Fill the base with water or sand to maintain your markerboard outside. Once you've generated your exhibit board, merely slide the board down onto the aluminum posts of the springer and you are ready to go! 18.0" x 41.0" x 17.5"